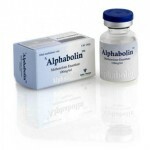 Methenolone represents a DihydroTestosterone (DHT) based anabolic steroid. 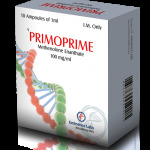 It is an ester derivative of Methenolone and it is used by people who are very susceptible to estrogenic side effects. 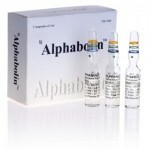 Methenolone, in form of Enanthate and Acetate, is available as an injection or as an oral respectively. The injection is naturally regarded as having a higher bioavailability. It is an Enanthate ester which is quite long-acting. Because it by-passes hepatic breakdown on the first pass, it also has a higher survival rate. Methenolone is not 17-alpha-alkylated, but 1-methylated for oral bioavailability, a fact that reduces the stress on the liver. Methenolone does not aromatize and does not convert to estrogen. It is considered a good fat burner due to its high capacity for binding to the androgen receptors. Methenolone Enanthate produces important results in both men and women during a cutting cycle as it exhibits an ability to retain muscle on a calorie restricted diet. It has the property not to aromatize, so estrogen related side effects are of no concern. This fact is very useful when leading up to a bodybuilding contest, as subcutaneous water retention (due to estrogen) can seriously harm the look of hardness and relief to the muscles. During a cycle the user should additionally not have much trouble with blood pressure values, as this effect is also related to estrogen and water retention. At a moderate dosage Methenolone Enanthate should also not interfere with endogenous Testosterone levels as much as when taking an injectable Nandrolone or Testosterone. Many bodybuilders use it in between steroid cycles during their “off-time” to help maintain their gains and strength. Some athletes do prefer to combine Methenolone Enanthate containing products with bulking drugs such as Methandienone or Oxymetholone. During a dieting or cutting phase, a non-aromatizing androgen like Halotestin or Trenbolone can be added. During cycle it also can be stacked with compounds as Oxandrolone or Stanozolol.